The Thrilling new feature film "The Samaritans" will have it's long awaited New York City Premiere tonight with a star studded after party at new hotspot The VNYL! We have been fortunate enough to view this film, this is one of the most creepy, scary, heart pounding films we have seen in a long time. Trying to put into words what we saw unfold was just pure mayhem. This may possibly be the most fearful, shocking, frightening film of the decade. 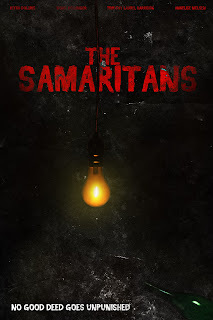 The Samaritans is so shocking, it will keep your mind drenched with paranormal fear for days. Lets break down this little gem, first of all the ensemble cast is stellar! The whole movie is carried by this group of four creepy cast members. They keep you so engaged its almost like you can't wait to hear what they say next and can't help to wonder what sickening thing they may do, to say the least. Doug Bollinger from (Waltzing Anna & Mail Order Bride) fame directs & writes this piece of insanity, while also dubbing as a cast member. He keeps the cast flowing and not once do you lose engagement in this 75 minute thrill ride. So many things could have went wrong in the making of this film. When you watch it you will understand, however everything seems to magically fall into place with this one from start to finish and WHAT A FINISH it is. Bollinger delivers with a outstanding performance. He adds some minimal relief at moments with some comedic remarks then its right back to the disturbed genius he is and reels you in and keeps you on the edge of your seat. Keith Collins (The Evangelist) who inked the story of this freak show, does his usual and takes us to such a elevated dark place. His character is so eerie he just gives you the chills makes you uncomfortable and uneasy while you squirm in your seat. Collins is very frightening in this film. Newcomer Annelise Nielsen delivers a extremely fearful performance. She keeps you guessing and in fear of what is going to happen next. Every moment Nielsen gives to the screen is astonishing. A top notch show. Timothy Laurel Harrison (Out of my hand) brings in such shock. Harrison really goes for it in this film and is so believable and scary rounding out this ensemble. Giving the audience many chills with the way she conveys her emotions to the screen. Harrison is fantastic in this film! For a film that boasts "No good deed goes unpunished" really delivers. Be on the look out for this one when its released you won't be disappointed. Good luck New York City The Samaritans are coming for you!! "The Samaritans" tells the story of Four co-workers who get together to finish a project at their manager's home. They haven't actually met face to face and they discover they have more in common than the new App they are perfecting. As they piece together their histories, they realize that each of them has a deadly secret that could reveal a way out or seal their fates. Their pasts have provoked a vengeful force to show them the errors in their ways. The home they have been summoned to becomes their court and their prison. Can they prove that history doesn't repeat itself? Can they redeem themselves before time runs out? Will they figure out their fateful bond before revenge has its way with them? STARRING: Keith Collins, Doug Bollinger, Timothy Laurel Harrison, Annelise Nielsen. Directed By, Doug Bollinger. Produced by Keith Collins, Doug Bollinger, Cory Green, Matt Grego. Cinematography By Cory Green. Edited By, Cory Green and Matt Grego. Written By, Doug Bollinger. Story By, Keith Collins. Original music by, Olivia Bec.